Early in 2015 the Michigan Court of Appeals (MCOA) handed smart meter resisters what can only be regarded as two major setbacks, denying nearly all claims against the DTE “opt-out” plan and the Consumers Energy “opt-out” plan. We have analyzed these decisions in earlier articles on this site. Suffice it to say we think that, in the DTE case at least, it is very clear that the three judge panel hearing that case did not follow existing case law and chose instead to make new law to suit the needs of the smart grid political agenda. Image above courtesy of digitalart. (1) Stenman Appeal: This case is unique among our cases in that it is the first appeal to be heard of a case that originated in a circuit court. All our other appeals have been cases that originated in the Public Service Commission. The Court of Appeals has much more latitude when reviewing a circuit court case than it does when reviewing the actions of an administrative agency. For those of you who have changed your own meter, or have a plan to do so or have suffered a disconnection of service, this case is particularly relevant. If this appeal goes well we may finally have a way to stop DTE from forced installations all over their service territory! Early in 2012 Ralph and Donna Stenman, of Farmington Hills, pleaded with DTE to remove a smart meter that had caused health problems for Donna, who is a cancer survivor, and was concerned, not only for her immediate symptoms, but also because the World Health Organization had rated in 2012 the type of microwave radiation that cellphones and smart meters produce “a possible carcinogen”. Their pleas to DTE were also based on a smart meter being a hazard for Ralph because the atrial fibrillation in his heart, put him at risk for blood clots and a stroke. The cause of Afib, per WebMD.com, is “rapid, disorganized electrical signals”. Smart meters put out very brief but high energy pulses about every 15 seconds that cause many people to experience irregular heartbeats. Pleas were first made by letters to DTE – to no avail. In March of 2012, following a method that had been encouraged by Jerry Day and using a modified version of his suggested form, the couple sent DTE a document titled “Affidavit Notice and Demand for Removal of all “Smart Meters”, radiation emitting and surveillance devices.” The document stated that if DTE would not remove the smart meter within 21 days, the couple would do so, replacing it with a “safe and legally compliant meter, rated and calibrated to common metering standards”. Upon refusal of DTE to remove the offending meter the couple found it necessary to take that action themselves. A licensed electrician was engaged for the job, readings of the smart and analog replacement meter were duly recorded and the smart meter safely shipped back to DTE. The utility responded first with threats and intimidation. Then a letter indicating that power would be disconnected, but ultimately sued the Stenmans instead in the Oakland Circuit Court. Attempts were made to find an attorney for their defense, but every attorney contacted stated that if he took on the case DTE would bankrupt him. Ultimately the Stenmans found it necessary to represent themselves in court. 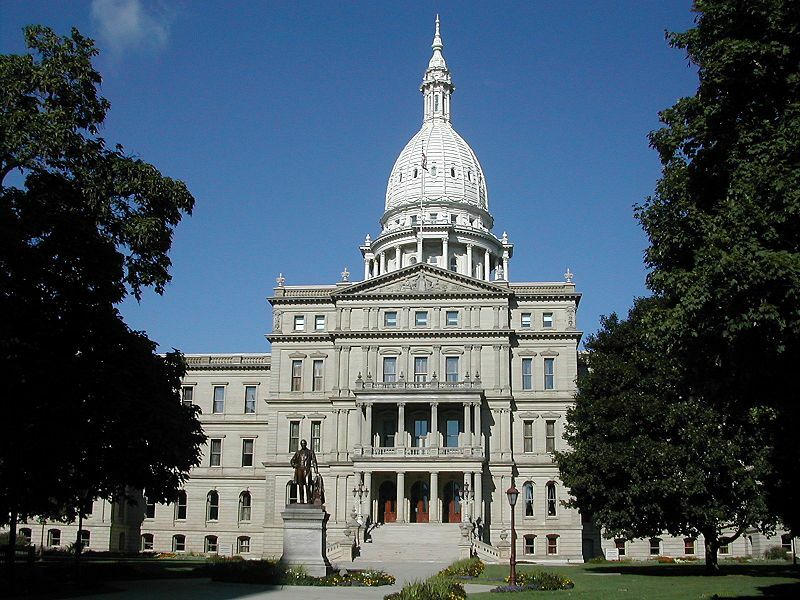 Michigan Stop Smart Meters was pleased to arrange some assistance for them in the drafting of needed documents. In the fall of 2012 the case was heard by Circuit Judge Rudy Nichols. The essence of the case was a demand for a “Partial Summary Judgment” which would include an injunction forcing the Stenmans to allow DTE employees back on their property to reinstall a smart meter. The injunction was to be permanent but the judgment would be considered partial only in the sense that a DTE claim against Stenmans for money damages would remain open to possibly be determined by a trial later. A “Summary Judgment” is a judgment made without allowing for any trial or evidentiary hearing. There are long established legal principles that allow for this type of judgment when there are no material factual issues in controversy and the judgment can be rendered purely as a matter of law, based on facts agreed to by both sides. Whether a “smart meter” is actually a lawful device that conforms to the definition of meter in the statute and in the regulations. Whether the “digital meter” then being offered as an alternative would be any more lawful than the smart meter. Whether either a smart or digital meter would threaten the Stenmans privacy. Preliminary evidence was offered in the form of a document authored by the National Institute for Science and Technology (NIST) to establish that smart meters are a threat to customer privacy and that they should only be installed on request of the customer. Whether either a smart or digital meter would threaten the Stenman health. Preliminary evidence was offered in the form of an affidavit from Dr. Donald Hillman, retired MSU professor, relating the story of a little girl whose health had been severely compromised by the installation of a DTE smart meter. Judge Nichols, in his Order of November 11th 2012, stated that the Hillman affidavit was irrelevant because it described what happened to another family, not what happened to the Stenmans. He ignored the other three arguments entirely, granted DTE’s motion for partial summary judgment and ordered the Stenmans to permit DTE employees to enter their property for the purpose of reinstalling a smart meter. We agree with the Stenmans that Judge Nichols order was outrageous. An appeal was filed. Again this had to be done with the Stenmans representing themselves as no attorney could be found willing to take on DTE. Again Michigan Stop Smart Meters was able to arrange some needed assistance in the preparation of an appeal brief and the drafting of other documents. By agreement of both sides Judge Nichols put a stay on his order pending a decision by the Michigan Public Service Commission (MPSC) regarding an “opt-out tariff” proposed by DTE where the only “opt-out meter” to be provided was a smart meter with one of its two transmitters turned off. In May of 2013 the MPSC approved DTE’s proposal that opt-out customers must pay an initial fee and monthly fees and receive only a “non-transmitting meter”. Following this DTE moved to have the stay lifted. This might have made the installation of a smart meter follow in short order. Stenmans argued that there was an appeal of the opt-out plan before the Michigan Court of Appeals and other appeals also pending. They brought in letters from their doctors to establish the harm a smart meter would cause them. Mr. Stenmans cardiologist provided a signed letter stating that installation of a smart meter “could lead to a bad outcome” for Mr. Stenman. They brought in evidence that DTE had accommodated other families in their neighborhood with analog meters. Yet Judge Nichols lifted the stay. As it happened DTE did not enforce the court order. We suspect the company was more interested in the legal precedent this case established than in actually getting a smart meter installed. As the time for oral argument began to draw near the Stenmans were finally able to find an attorney to file a reply brief and take on the job of oral argument. It has taken nearly two years, including an initial period where both sides filed briefs, for this appeal to reach the stage where oral argument will be heard. Please come and show, not only your support for the Stenmans, but your support for the principle that nobody should be forced to have a health damaging surveillance device on their home. Pack the courtroom in downtown Detroit on Tuesday, June 9th. (2) Sheldon Appeal: This case, while originating in the MPSC, is also unique in that it is the first case in which the Court of Appeals (MCOA) is being asked to hold the MPSC in contempt of court for failing to carry out a previous order of MCOA. It is also the only case to reach MCOA where the overall funding of smart meters in DTE’s service territory is called into question. This is the case for those of you who have been appalled that the MPSC, without ever holding an evidentiary hearing on the privacy or health implications, would give DTE permission to charge back the costs of 2.4 million smart meters to its customers! This order went beyond what the appellants had asked of the court. Does it sound like the Court of Appeals was instructing the MPSC to just consider the rates that utility customers would have to pay to fund smart meters? Incredibly that is all the MPSC did, in complete defiance of the court’s order. Not only that but four smart meter resisters who wanted to participate as interveners in the reopened case were denied that right – mainly on the basis that we wanted to raise issues having to do with the risks of AMI technology which the administrative judge said were “beyond the scope” of the remand proceeding. I was one of those who tried to participate and was shut out. The others were Linda Kurtz and Dominic and Lillian Cusumano. Three of us then protested the decision of the administrative judge to the Commission and were denied again. On October 17th 2013 the Commission issued its final decision in the reopened case. To nobody’s surprise they only re-justified the decision they had made the first time around. With no new kinds of evidence being allowed, how could the outcome be any different the second time? Michigan’s current Attorney General Bill Schuette did not appeal this decision nor did ABATE. On November 16th 2013 David Sheldon did appeal that MPSC decision. He asked the appeals court to find that MPSC should be held in contempt of court for failing to carry out the court’s previous order, and that the case should again be sent back to MPSC for another redo – but this time allowing for the scope of the case to include the health, privacy and safety issues, and allowing new interveners to join the case and introduce evidence concerning the issues that had previously been neglected. That it was wrong of MPSC to limit the scope of the case to just determining the amount of cost recovery for DTE on this investment and thereby denying the opportunity for anyone to introduce evidence regarding health, privacy and safety issues. That it was wrong for MPSC to exclude the very interveners in the remanded case who would raise the issues the Court of Appeals required MPSC to address. That even if the MPSC’s authority be limited to setting rates (as some have argued) the Commission could still have used that rate setting authority to deny rate recovery of smart meter costs after a finding that the technology harms the customers and the public. Denial of rate recovery would almost certainly have meant no smart meter program in Michigan. Moreover the MPSC had jurisdiction from the legislature to directly order DTE to correct health and privacy abuses when acting in response to written complaints. And there were written complaints from 35 city and county governments and from over 400 utility customers. As with the Stenman case, it has taken nearly two years, including the time for filing briefs, for this case to reach the stage of oral argument. Please come and show your support for a case that seeks to have MPSC “held in contempt” for its dereliction of duty in approving the entire smart meter program without hearing the evidence. Pack the courtroom in Lansing on Wednesday June 10th. Attached is the culmination of untold hours of intense effort, careful thought, research, collaboration, and numerous revisions over an almost two month period. The primary writers of the bill were passionate activists, highly motivated to draft legislation that would guarantee our health, safety and privacy would be secured by giving everyone the right to choose to have, or not to have, a dangerous, life threatening surveillance device installed upon their living or working quarters. “Utility Meter Freedom of Choice Amendment” (to Michigan Public Act 3 of 1939). Attached are two versions: one for the State House of Representatives and one for the State Senate. It’s the same bill with different captions. Be sure to send the correct bill to your lawmakers. This bill was drafted for all smart meter activists and their organizations, as well as all legislators: local, county, state and federal. Not only did we activists have a common goal before the bill was drafted, but we now have a document unlike any other that puts our legislative demand into words. Please share freely with all parties of interest. We need to bombard our state legislators with requests to bring this bill up for passage. Call their office. Ask to speak to the legislator. If unavailable, explain to the staff member that you will be Emailing him/her a bill that you want introduced or co-sponsored if it’s already been introduced. Ask the legislator or staff if they are familiar with the issue. If yes, ask if they will champion the bill and help move it through committee and bring it up for passage. Ask for them to get back with you after they have read the bill and looked at the information to let you know where they stand on the issue. If you don’t hear from them in a week call back and let them know that you would like to know what their position is. You might ask if you could set up a meeting to make a presentation. Have documents, websites, videos and other activist friends available. The more of us who contact the legislators, even if it’s the same legislator, the greater our impact will be. Not everyone is expected to use the same method for persuading their legislators. In fact it’s far better that we each use our own individual ingenuity for turning this bill into law, with the above points as a guide. We could not have a more highly qualified group of well-informed, passionate activists, all very capable of presenting the need to pass this legislation. The bill is intended to be rallying point around which we can all now focus our attention as it will unite us as one mass movement to secure our rights. Please distribute the bill widely and spread the word that we will persist until we once again secure the blessings of life, privacy, liberty, safety, health, property rights and freedom. And whatever else you may wish to include, based on the tons of health, safety and privacy info. related to smart meters. Smart Meter Hearing before the House Oversight Committee. Other events planned for earlier in the day. If you can attend only the hearing come at 3 pm to Room 519 in the Anderson House Office Buildingat 124 North Capitol Avenue (across the street from the Capitol Building). Come to speak or come just to show your support! This will be an opportunity for all of us who have concerns about smart electric meters to come and have our say before a legislative committee. It is also an opportunity to submit evidence or documents for consideration by the Committee. Be sure to bring 30 copies of anything you plan to submit. Your presence at the hearing will help to show the legislators that there is strong support for our positions. If possible wear something red (or wear a red ribbon that will be available at the door). This hearing will be videotaped and may be up on the Committee website later. This Committee is chaired by Rep Tom McMillin. It can only begin its hearing after the House session (across the street) ends. So actual starting time could be anywhere from 3 pm to 5 pm. Upon arrival, check in with guard. If the hearing room is not yet open when you arrive, congregate with others in the lobby on the main floor until the room opens. It is most important that we have as many as possible – particularly during the first hour of the hearing when news media will be present. Tom has assured us that this hearing will run as long as necessary to give every person a chance to speak for the record! Hearing may run late into the evening. Other Activities Planned for That Day: If you are planning on coming for the hearing you may also want to come earlier in the day and join us for other protest activity planned by Pam Wallace and Dee Hilbert. If you come at noon that day you can join us for a demonstration in front of the Capitol building. The Capitol building is at 110 South Capitol Avenue (at the corner of Capitol Ave and Michigan Ave) Please bring a sign and wear warm clothing. In the morning some of us will be in the Senate lobby having our Senator called out of session by the Sergeant at Arms to talk with us about smart meter legislation. In the early afternoon some of us will be in the House lobby having our Representative called out of session by the Sergeant at Arms to talk about smart meters. 9:30: meet in Lansing at the state capital. Check in with guard who will direct you to Room 426 reserved for us by Rep Tom McMillin. 10:00: smart meter rally at the state capital with themed signs and information to pass out to senators as they enter the capital for session. 10:00-12:15: pull out your senator from session to share your concerns about smart meters and request help and protective legislation. 12:15 meet at Room 426 in Capitol building. 12:30: smart meter rally at the state capital with themed signs and information to pass out to our state representatives as they enter the capital for session. 12:30-3:00: pull out your state representative from session to share your concerns about smart meters and request help and protective legislation. 3:00/4:45 and on: smart meter hearing will be held at the Anderson House office building (directly across from the capital) in Room 519. The hearing will begin right after the house session and the start time will range anytime from 3:00-4:45. If you plan to take part in these activities all day it will be important to bring water, food and a snack. Also bring a sign to carry for our outdoor demonstrations. Oregon, Washington, Maine and Vermont Have Analog Opt- Outs- Michigan Wants An Analog Opt-Out Too! The World Heath Organization Has Classified Smart Meter Radiation As a Type 2 Carcinogen. They Are Not Safe. 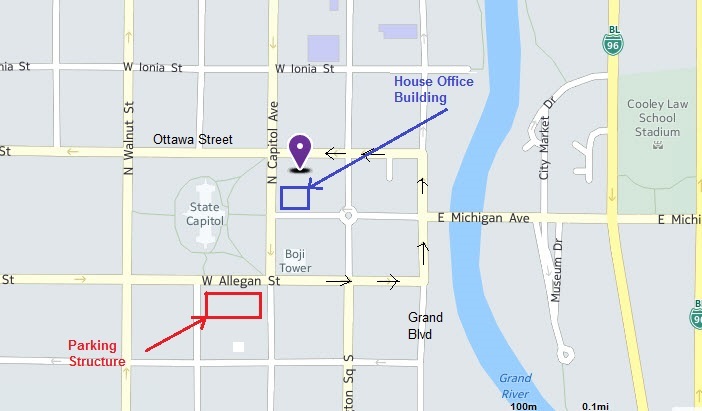 Directions to Capitol from Detroit area: Take I 96 to I 496 West, then exit 7A service drive to right turn on Grand Ave (headed north 1-way) to left turn on Ottawa (headed west 1-way) to left turn on Walnut Street (headed south) to left turn on Allegan Street (headed east 1-way) to parking structure on Allegan street. You will be right next to Capitol and 1 block from the Anderson House Office Building. November 7th, 2012 Update – At the hearing today the judge came very close to dismissing the entire case Detroit Edison had brought against the Addison Township couple for changing their own meter. She suggested the possibility of a dismissal of the DTE case “without prejudice” that would leave the door open for Detroit Edison to refile its complaint in 6 months if they still felt that other developments (in the MPSC opt-out case) had not resolved the issue. The DTE attorney would not agree to this plan and the couple did not want a 6 month stay because they have no expectation that the MPSC case is going to resolve this dispute. In the end the judge decided to give Detroit Edison another month, until December 5th, to come up with a meter that would be acceptable to the couple and to resume normal meter reading practices. We now think there is a fair chance Detroit Edison will offer to put an analog meter back on the house as an interim solution, in order to avoid the jury trial the couple asked for, until the MPSC completes its opt-out case and enacts an opt-out plan. The earliest that could happen would be next May, though it could be much later if there is an appeal of the MPSC decision. If Detroit Edison shows no inclination to compromise then the Court, on December 5th, will likely order the case to proceed to trial. November 7th, 2012, 10 am – Detroit Edison Smart Meter Case Coming to a Head – On this day there will be what is called a “Motion Hearing” in the case of Detroit Edison versus the couple from Addison Township, in the courtroom of Oakland Circuit Judge Shalina Kumar. (1) Motion for Summary Dismissal – In this one the couple are seeking to have Detroit Edison’s entire case thrown out because, they say, the utility never had any legal authority to install ‘smart meters’ on non consenting customers in the first place. There was, apparently, nothing in the MPSC approved tariff that ever authorized smart meter installation, nor was there any rule lawfully issued under the Commission’s rule-making authority. (2) Motion to Allow Counter-Claim – In this one the couple is seeking an injunction against the utility to prevent the latter from terminating electrical service to the home for refusal to accept a ‘smart meter’. An earlier attempt to bring the counter-claim had been denied for highly technical reasons. The couple is hopeful that this second attempt will prevail. So far the utility has refrained from carrying out an earlier threat to disconnect power. (3) Motion for Protective Order on Discovery – In this one the couple has asked the judge to limit the scope of a deposition to proper subject matter and to impose some conditions on the manner in which the deposition can be taken. (4) Detroit Edison’s Motion for Stay of Proceedings – In this one the utility is asking the court for a time-out until next May in order that any decision made by the MPSC in the opt-out fee case can be considered, at least in part, as a basis for deciding this case. The couple will be opposing this stay in the belief that, whatever the outcome in the MPSC case, this case should be decided on its own merits and sooner rather than later. Persons who would like to follow this case are encouraged to attend the hearing. We would also welcome comments from our readers in the “Comments” window below.